Putting Zeppelin NT004 through her paces for a full performance check out is Zeppelin Chief Pilot, Fritz Gunther (L). Tracking all the figures in the right seat is Airship Ventures Chief Pilot, Scott Danneker. 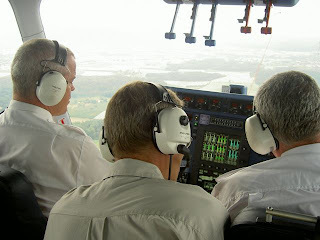 In the middle, keeping an eye on all the technical aspects is Airship Ventures Technical Manager/Inspector, Matt Kilkerr. Under their watchful eye over almost three hours, the airship was heavily tested and passed with flying colors. A magnificent vehicle.